The United States Congress designated the Alpine Lakes Wilderness (map) in 1976 and it now has a total of 414,325 acres. All of this wilderness is located in Washington and is managed by the Forest Service. Designated in 1976, the Alpine Lakes Wilderness covers over 400,000 acres of the famously scenic Washington’s central Cascades. The Forest Service manages the Wilderness, shared between the Mount Baker-Snoqualmie and Wenatchee national forests. Terrain The Wilderness lies between Snolqualmie and Stevens Passes in the North Cascades portion of the Cascade Range, including the sub-range called the Wenatchee Mountains, which forms the Wenatchee-Yakima divide. Associated with the Wenatchee Mountains is the Stuart Range, a jagged batholithic crest crowned by 9,415-foot Mount Stuart that includes the sublime Enchantment Peaks. The Chiwaukum Mountains are another subsidiary range constituting the high country around Frosty and Deadhorse passes in the Wilderness’s far northeast. The Alpine Lakes Wilderness showcases some of the most astonishing terrain in the entire Cascade Range: sawtooth ridges, sharp summit spires, ice-scooped U-shaped valleys, and hundreds of glacially excavated lake basins. Small glaciers persist in the Stuart Range and along the high crest between Chikamin Peak and Mount Daniel. Geologically the Wilderness includes a range of rock types representing the volatile tectonic activity along the western edge of the North American continent. Formations include sedimentary and metamorphic rocks associated with micro-continents that slammed into North America some 100 million years ago as well as more recent granitic intrusions. The latter category includes the great 80- to 90-million-year-old batholith of the Stuart Range. Ecology The Alpine Lakes Wilderness saddles the Cascade crest, and thus exhibits a striking range of vegetation communities from west to east due to differences in elevation and precipitation. The crest annually receives some 180 inches of rain and (mostly) snow, while lower elevations in the eastern portion may see just 10 inches of precipitation a year. Seasonal temperate rainforest of Douglas-fir, western hemlock, and western redcedar cloaks lower western slopes; upslope, a subalpine forest of silver fir, noble fir, and mountain hemlock gives way at timberline to a mosaic of fir/hemlock tree islands and alpine meadows. Avalanche chutes are brushy with alder, vine and Rocky Mountain maples, and other shrubs. The leeward alpine zone includes magnificent stands of alpine larch—the golden autumn foliage of which flares the Enchantment Lakes Basin—as well as subalpine fir, whitebark pine, and Engelmann spruce. Lower eastern ridges and slopes include grassy woods of ponderosa and lodgepole pine. 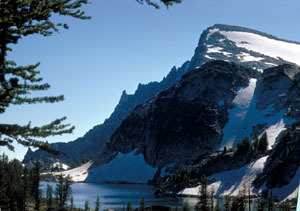 Given its trans-Cascades extent, the Alpine Lakes Wilderness provides habitat for west-side black-tailed deer and Roosevelt elk and east-side mule deer and Rocky Mountain elk. Mountain goats roam the high country. Other mammals includes puma, gray wolf, black bear, bobcat, and mountain beaver (aplodontia). More than 150 species of birds have been recorded in the Wilderness, from dippers and varied thrushes to bald eagles. Notes The legacy of past logging and mining operations in this portion of the Cascades, which punched many access roads into the mountains, explains the wildly irregular boundary of the Alpine Lakes Wilderness. Numerous hiking trails provide access to the Alpine Lakes Wilderness, including a significant stretch of the Pacific Crest National Scenic Trail. Given its proximity to population centers and its much-lauded beauty, the Wilderness is an exceedingly popular one, especially in its upper lake basins. To protect against overuse, backpackers must have permits to enter certain areas between June 15 and October 15, and campfires are banned above 5,000 feet. It goes without saying that all visitors should follow Leave-No-Trace practices in this fragile wildland. The granite jags and spires of the Enchantment Lakes area, notably the Cashmere Crags, account for some of the finest rock-climbing in the western U.S. Routes range from low Class 5s to 5.11, from faces as long as one lead (the length of rope used for climbing) to 1,500 feet. The names of some of the pillars, though, might give you pause: Bloody Tower, Cruel Thumb, Cynical Pinnacle, and Crocodile Fang. The Pacific Crest National Scenic Trail (PCT) enters from Stevens Pass on the north to follow the crest south, with a long westward bend to Snoqualmie Pass, a distance of 67 trail miles. Hordes of people take advantage of the PCT's 450 miles or so of excellent trails. Subsequent use and abuse of the area has resulted in a permit system, which is applied to some regions of the Wilderness between June 15 and October 15. No dogs are permitted, and campfires are banned above 5,000 feet. Planning to Visit the Alpine Lakes Wilderness? How to follow the seven standard Leave No Trace principles differs in different parts of the country (desert vs. Rocky Mountains). Click on any of the principles listed below to learn more about how they apply in the Alpine Lakes Wilderness.